As a blog series special over the next couple of months, ACo will be featuring brands carried in our Carmel showroom! Our January spotlight: Milliken! With over 35 manufacturing facilities worldwide, Milliken floor coverings has been beautifying offices, hotels, homes and commercial spaces since 1865. With a passion for design, Milliken produces an array of innovative textiles and floor coverings in a variety of colors, materials and patterns. 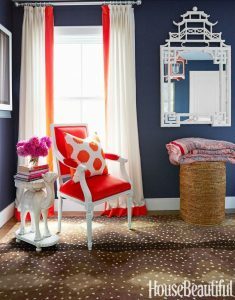 One of our favorite design secrets for an odd-shaped or oversized space is selecting a broadloom carpet that accents your room design with pattern and texture, specify the dimensions and have it bound, serged or fringed! An example from House Beautiful, below, where the carpet is perfectly cut to expand the appearance of the room size. 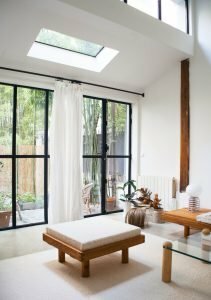 For our modern readers, this particular Remodelista (also below) had the hardest time finding a pre-cut neutral rug to her liking, so she selected a favorite plush carpet and bound the edges to her size preference! Although virtually any loom carpet can be cut to size or shape, we particularly love Milliken’s 10-year customer warranty and MilliGuard, a 5-year soil and stain-resistant protection! Pets? Kids? Heavy foot traffic? The extra protection and guarantee makes the investment in a custom rug completely worth it for years to come! Our favorite pattern, you might ask? 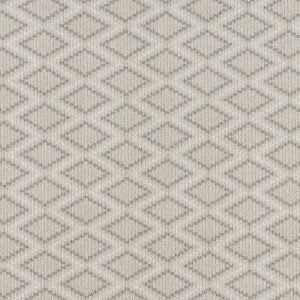 We love the Hardanger as a residential rug – the texture, monochromatic colors and geometric pattern gives us all the feels. In the market for a custom cut rug? With hundreds of Milliken options, be sure to check out your local Milliken dealer, ACo. You’re sure find (and feel) your new favorite custom rug! Please visit the ACo website at https://liveaco.com or give them a call to schedule your appointment at 317.575.9540. For more information on Milliken and their products visit https://floors.milliken.com/floors/en-us/segments/residential.